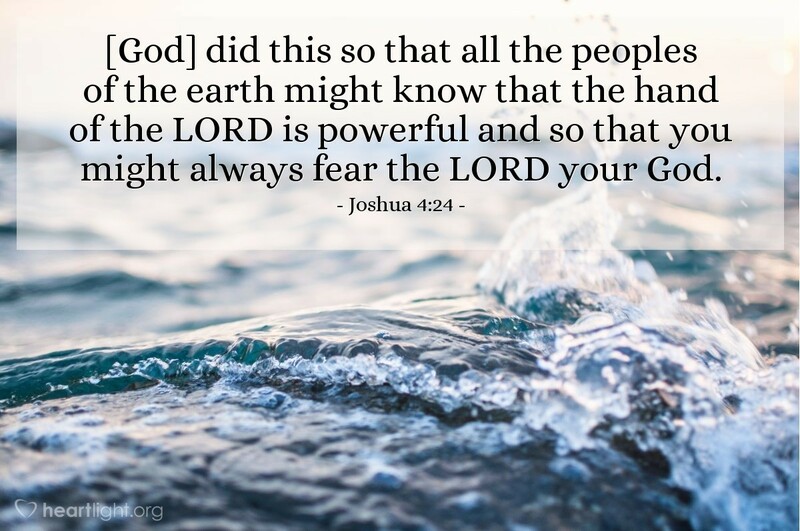 God brought the Israelites miraculously through the Jordan River during the flood season because of his love and grace and to fulfill his promises to them. But he was also making an important statement about himself and his people. He always wanted Israel to "reverence" him. In addition, he wanted Israel's enemies to quake with fear. They did. And God won a great victory for himself and his people because of his faith. Holy and majestic God, you are clothed in righteousness and bathed in glory. I want to always treat you with the respect and reverence you deserve. Please forgive me for the times when I was not as reverent or respectful of you as you deserve. Forgive me when I didn't hold your name up as holy when others were using it in vain. You are worthy of my life, my love, and my all. I want to bring praise to you now and forever. In Jesus' name, I pray. Amen.